Our APC Symmetra PX Battery Unit Replacement Battery Unit is a Plug & Play Replacement unit which consists of 8 X 12V 7.5AH Brand New Batteries assembled in 1 original refurbished Symmetra PX Battery Unit cartridge. The batteries inside the Replacement Symmetra PX Battery Unit unit are 8 SigmasTek 12V 7.5AH batteries. 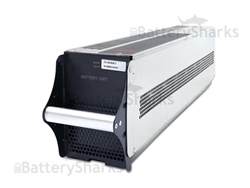 If you need more help purchasing APC Symmetra PX Battery Unit - Replacement Battery Unit, please call our customer service department at (800) 657-1303 or e-mail us. Our experienced and knowledgeable staff is ready to assist you. Buy your APC Symmetra PX Battery Unit - Replacement Battery Unit with confidence today! You get superior long life batteries and the best price on the market. Orders for in-stock items are typically shipped within 24 hours.